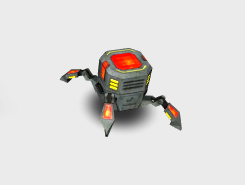 The spider robot (or mine-bot) which has been copied from the Unity Example Project can have this script attached to be able to pathfind around with animations working properly. This script should be attached to a parent GameObject however since the original bot has Z+ as up. This component requires Z+ to be forward and Y+ to be up. A movement script (e.g AIPath) must also be attached to the same GameObject to actually move the unit. Animation is handled by this component. The Animation component refered to in anim should have animations named "awake" and "forward". The forward animation will have it's speed modified by the velocity and scaled by animationSpeed to adjust it to look good. The awake animation will only be sampled at the end frame and will not play. When the end of path is reached, if the endOfPathEffect is not null, it will be instantiated at the current position. However a check will be done so that it won't spawn effects too close to the previous spawn-point. Should hold animations "awake" and "forward"
Speed relative to velocity with which to play animations. Effect which will be instantiated when end of path is reached. Point for the last spawn of endOfPathEffect. Called when the end of path has been reached.